From the author of the Number 1 best-selling The Perfection of the Morning. “The first night she hardly noticed he was gone, and even though she had expected him back before the moon rose, she slept soundly.” So begins acclaimed novelist and literary nonfiction writer Sharon Butala’s new novel. By the end of the first chapter, Sophie Hippolyte’s husband Pierre will have been gone for three days, and the suspense, as a lone horseman approaches their homesteader cabin in the southwest Saskatchewan of the 1880s, is palpable. In language that is haunting, elegiac and rich with detail, Butala casts an unblinking eye on a merciless West that has become obscured behind headlines about wheat and oil prices. 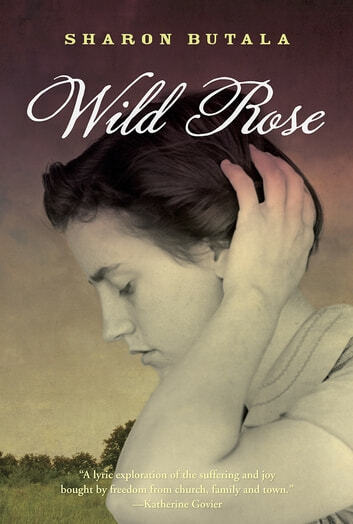 Sophie’s West – filled with sodbusters and cowboys, fallen women and proper ladies, settlers and Indians – comes vividly alive in the pages of Wild Rose, Butala’s most unforgettable novel. This is a lyrical story of the open prairie as a main character along with the settlers who struggle coping with the land. The descriptions of the prairie rang true for me although I could never express the intense emotions they evoke. I enjoy Sharon Butala's writing so much, and wanted to like this more than I did. The plot line was captivating, and the descriptions of the harsh prairie life endured by the young heroine were mesmerizing. But the sudden ending was a let-down. And the very prolonged description of the heroine's past with her almost daily thoughts made the story drag so much, that I skipped many pages. More tightening and a less contrived ending would have helped this novel. Good story. Interesting how religion impacted women's lives and choices in late 1800's. Wonderful description of Saskatchewan in winter and summer. Character development was good but seemed a little contrived. This is a very real look at the early settlement of T he West. Butala has great descriptive powers as an author and the story is quite captivating. I enjoyed it thoroughly but felt a bit let down with the ending. Perhaps leading to another book or a trilogy? Certainly screams for one. Wild Rose a wonderful story. Absolutely loved this story ! The Characters were so real I thought I knew them personally. Wonderful book, can't say enough about it, will be recommending this to my book club. Can't wait to read all her books !